The Horror Digest: Pieces: Black Rubber Gloves Do NOT Make Doing Puzzles Easier. Pieces: Black Rubber Gloves Do NOT Make Doing Puzzles Easier. Why did it take me so long to see Pieces? That's what I was asking myself the entire time that I was watching this last night. 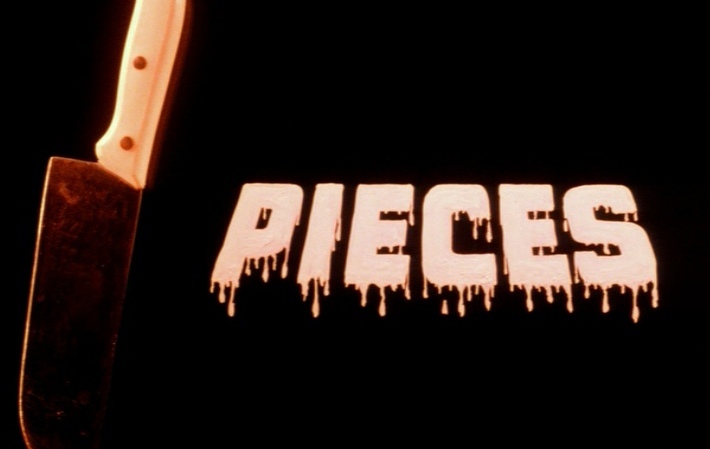 Pieces is like finding a 20 dollar bill in a pair of jeans that you haven't worn for years. Pieces is like suddenly realizing that you have half of a delicious sandwich waiting for you in the fridge. Pieces is like a snow day. PIECES is....like a dream. In 1942, a little boy was putting together a puzzle of a naked woman. 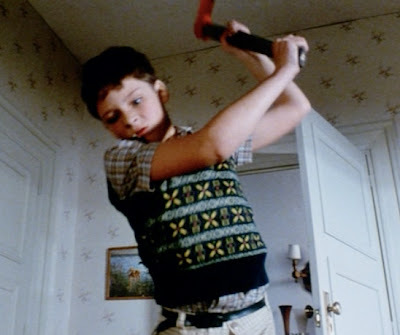 After his mother freaked out the little boy began hacking her body to pieces with an axe. And then sawed off some limbs..
Oooh Pieces. What did I do before you came along? I'm sure my life was entirely meaningless. How does one survive in this world when you don't know about the dangers of Kung Fu masters lurking in dark alleyways? How does one live their life without knowing that you can in fact cut a girl up in broad daylight with a chainsaw and no one will notice? Yes, Pieces provides insight to many of life's toughest challenges. Perhaps one of the things I really gravitated towards in this film, was its curious mixture of Giallo, Grindhouse, Sleaze. Yes the black leather gloves were switched for black rubber gloves. Think the kind of gloves one might wear to wash dishes. Incidentally, they are NOT good things to wear when putting together a puzzle. I chuckled quite loudly when they actually showed him physically struggling with putting a piece in the puzzle. Perfection. So here's the deal. Pieces is a terrible film but it's a film that is still a delight nonetheless. I liked this waaay better than The Prowler for instance which isn't a great film either but technically much better than Pieces. Pieces just has a certain charm about it I guess. It's a film that I'm not entirely sure can fit in any one genre comfortably. Pieces breaks rules, breaks conventions. It doesn't seem to be making a statement towards any one group of people---rather it's just a giant middle finger to the general population. Halfway through the film, the killer randomly trades in his super efficient chainsaw, for a less efficient although very menacing giant knife. What can we take away from this? The killer obviously works at a combined kitchen and hardware store--and also, that having one murder weapon doesn't have to be a rule. And you can stab people on water beds and it's the best thing ever, although not as fun as it sounds. I love this movie. I didn't even guess who the killer was because I'm stupid and was far too distracted by the idea that a girl put on a bathing suit under her clothes, only to take it off the minute she peeled off her sweater. Also, there was no greater moment in my life when blonde woman detective lady turned a corner and saw an Asian man who promptly started doing Kung Fu at her. After somehow knocking him out (I forget the details) the dashing lad with all the ladies came to see what happened, saw the Asian man and said, "Oh it's my Kung Fu instructor!" I kid you not this happened. Also the Asian man blamed his sudden craziness on some bad chop suey. Ugh why won't Pieces just marry me and get it over with?? Not to mention that the blood and gore in this movie rocks. Yeah, it's pretty sleazy and pretty awesome. Over and over and over again. You know same tone and everything because that's how I roll. So for real...Pieces? Amazing. I don't have much to say about it, because it's really a movie you just need to experience for yourself. Oooh Pieces, when will we meet again? Hopefully very, very soon. The early forties! Those were the good old days when young boys could entertain themselves putting together nudie jigsaw puzzles, complete with a girl with 70's hair. That makes it extra hot, when the girl's hairstyle is from the future. There was a time (maybe ten years ago) when no one seemed to know about this movie and I would make them watch it. Now nearly everyone who's into horror movies has seen it. I should have known that it was eventually going to ascend to cult status. I toooold you to watch this like a year ago!! lol Now go see Intruder! This is one of my favorite movies, despite being deathly afraid of it as a child merely because of the cover art. Seeing it for the first time at 18 years old I had a good long chuckle at how dumb I was for being scared of lil ol' Pieces. It's so bad that it's awesome! Great review. It has been a long time since my brother and I watched this, so I can't remember if this is the right one or not, but was this the movie with the tennis scene -- the one where the people were supposed to be really, really good, yet obviously couldn't play at all. That scene always cracked me up for some reason. Thomas-- I didn't even notice that futuristic hairstyle!! Man, this movie is too good I think. Too good for my heart to handle anyways. Haha yes! Two girls are playing tennis and they have terrible form. It's basically what I look like when I play tennis. I had forgotten about that part hah good stuff. The director of this film is one of the worst directors alive. I watched another one of his movies, the H.P. Lovecraft "inspired" Chthulhu Mansion, and it is without a doubt one of the worst movies ever made. And it is really entertaining just for that. I mean, Chthulhu Mansion ranks right up there with TROLL II and ROCK AND ROLL NIGHTMARE, in terms of so bad its goodness. But PIECES was this directors best film, and the fact that its still pretty bad, says a lot about him as a director. But whatever, I remember really enjoying PIECES inspite of its flaws. Amazing review! The images are really scary! Awesome blog! Okay, how come no one mentions that Bluto is in this movie? Also, the guy who plays Kendal is the lead singer in "Pod People." Who is Bluto?! I'm very unaware of things don't mind me. What kind of nightmare world the kids live in these days!